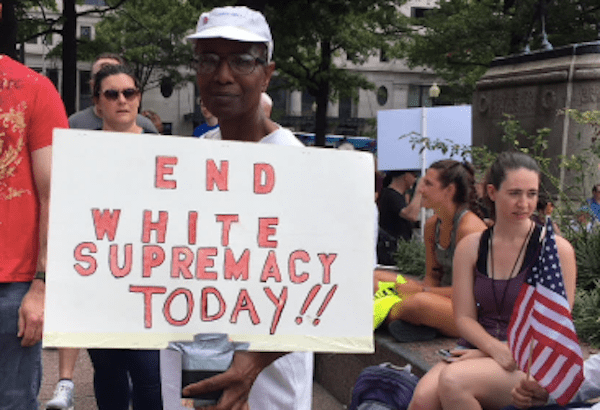 White supremacist rally-goers attempting to hold a Charlottesville anniversary event in D.C. were vastly outnumbered by counter-demonstrators. One year earlier, white supremacists had run through Charottesville, Virginia, creating violence and chaos that ended in tragedy. That was not the case in Washington, D.C. on 12 August 2018, the one-year anniversary of that event. Only about two dozen members of the so-called Unite the Right movement made a showing at the second go-around. “Unite the Right 2” instead resembled an August 2017 rally in Boston that was dwarfed by counter-protesters and forced to retreat early. Protesters led by organizer Jason Kessler were greeted at about 3 P.M. by a jeering crowd at the Washington, D.C. Metro’s Foggy Bottom stop. Flanked by dozens of police officers, they marched to their rally site at Lafayette Square across from the White House, while counter-demonstrators let them know their presence was unwanted. Once “Unite the Right 2” was inside Lafayette Square, counter-demonstrators surrounded the small group, chanting anti-Nazi and anti-Ku Klux Klan slogans and booing. Just outside the gates of Lafayette Square and separated from Kessler’s group by dozens of police officers, roughly 100 black-clad anti-fascist demonstrators waited for a chance to confront the group they called “Nazis.” But the two groups never made serious contact. The crowds began dispersing once the “Unite the Right” participants made a hasty exit in police vans roughly a half hour before their event was scheduled to begin. 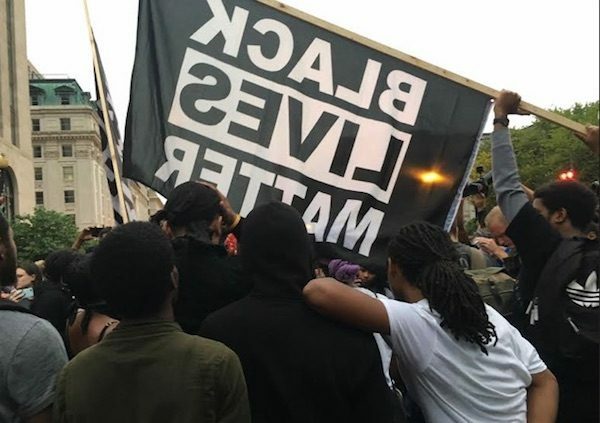 A group of counter-protesters held an impromptu Black Lives Matter rally at the intersection of Pennsylvania Avenue and 15th Street at about 7 P.M. after noticing that a handful of “Unite the Right” participants remained in the park. Counter-protesters also burned a Confederate flag but again dispersed once the remaining “Unite the Right” demonstrators had left the scene. Both the deadly 2017 and 2018 white supremacist rallies were organized by Kessler, who was chased out of Charlottesville by angry locals after a participant rammed his car into a crowd of counter-demonstrators, killing 32-year-old Heather Heyer. James Alex Fields, 21, of Ohio has been accused of that crime and is also facing federal hate crime charges (to which he has plead not guilty). Kessler attempted to hold the 2018 anniversary rally in Charlottesville, but the city rejected his application for a permit. Kessler sued and then abruptly dropped his case, obtaining a permit to hold a “white civil rights” rally across in D.C. across the from the White House from 5:30 P.M. to 7:30 P.M. His group left at about 5 P.M., however. According to Washington, D.C. Metropolitan police Chief Peter Newsham, there were no injuries and no violent confrontations associated with the day’s protests in the city, other than one arrest. During a press conference Newsham said Pennsylvania resident John Mulligan, 44, was arrested for pepper spraying a man in the face just after 5 P.M. Mulligan was found to be in possession of a slingshot, shards of glass, metal bolts and stones. Although the anniversary protest in D.C. was an apparent flop, D.C. residents who came out to protest seemed set on making sure it doesn’t happen again. USA Today. 24 July 2018. The Washington Post. 12 August 2018.